W. W. Norton & Company, 9780393079883, 304pp. Peter Zuckerman and Amanda Padoan explore the intersecting lives of Chhiring Dorje Sherpa and Pasang Lama, following them from their villages high in the Himalaya to the slums of Kathmandu, across the glaciers of Pakistan to K2 Base Camp. When disaster strikes in the Death Zone, Chhiring finds Pasang stranded on an ice wall, without an axe, waiting to die. 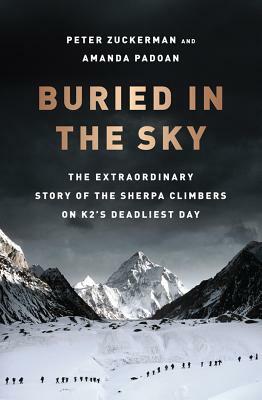 The rescue that follows has become the stuff of mountaineering legend At once a gripping, white-knuckled adventure and a rich exploration of Sherpa customs and culture, Buried in the Sky re-creates one of the most dramatic catastrophes in alpine history from a fascinating new perspective.